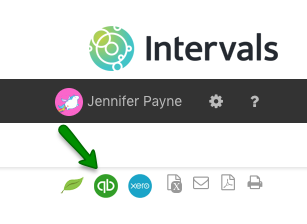 How do I integrate QuickBooks Online with my Intervals account? How does Intervals map invoices to QuickBooks Online? You will need to pick the customer to invoice from the customers dropdown. The customer dropdown contains a list of customers as they appear in your QuickBooks account. If you charge taxes, pick the rate you wish to use for your line items. Line item format applies to prefilled invoices and does not appear when copying a freeform invoice. This option allows you to transmit the whole invoice instead of just the types of work. What is shared between Intervals and QuickBooks Online? Below are the individual fields that are transferred when an invoice is copied. You can customize the line item format when copying an invoice that is based on work performed. The summary option copies over the line items from the summary section only, while the details option copies individual work items. Line item format cannot be customized for free form invoices. Copied to the Statement Memo field. Intervals lets the QuickBooks system decide the next invoice number. These fields are added to the “Message displayed on invoice” field. Available for invoices built from work performed (with time entries) and the detail line item format. Free form invoices do not send this value.